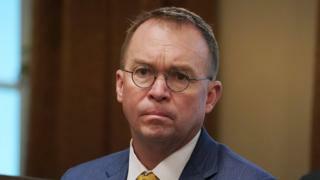 Image caption Mick Mulvaney called the bid to see President Trump's tax returns a "political stunt"
It comes after one of Mr Trump's lawyers said it was "harassment" to keep asking for his tax returns, and hinted at possible legal action in the future. "His request is a transparent effort by one political party to harass an official from the other party because they dislike his politics and speech," attorney William Consovoy said of Mr Neal. He said the request was a "misguided attempt" to politicise tax laws and could also end up interfering with audits. He said the US Treasury should not comply with the demand. Mr Trump also added that he believed the law was "100% on my side". In February Mr Trump's former lawyer Michael Cohen suggested during testimony to Congress that Mr Trump's taxes were not under audit during the 2016 presidential campaign - when Mr Trump said they were. Mr Trump had not wanted to release the tax returns because the resulting scrutiny could have led to an audit and "he'll ultimately have taxable consequences, penalties and so on".